Click image for full size image. If you haven’t noticed, this month at AHBE Lab has been dedicated to water conservation and sustainability – ranging from posts about city and state infrastructure, to those revolving around personal household habits, to offering “how-to” instructions for saving and reusing water. We even brought a little levity to what is a pretty serious challenge. 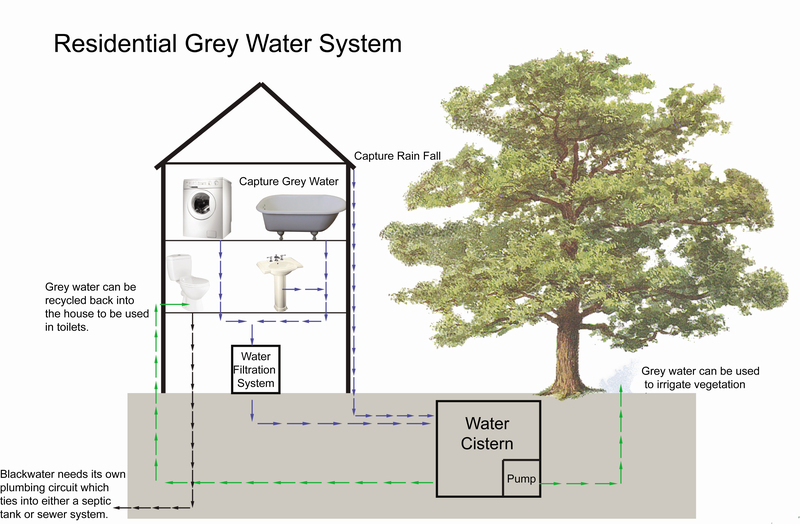 I thought I’d chime in with a diagram illustrating how collecting and using water at home can be utilized for creating a sustainable ecosystem at the residential level. Designers everywhere are looking to add water sustainability features into communities, including grey water systems, like this one for Eco Village. 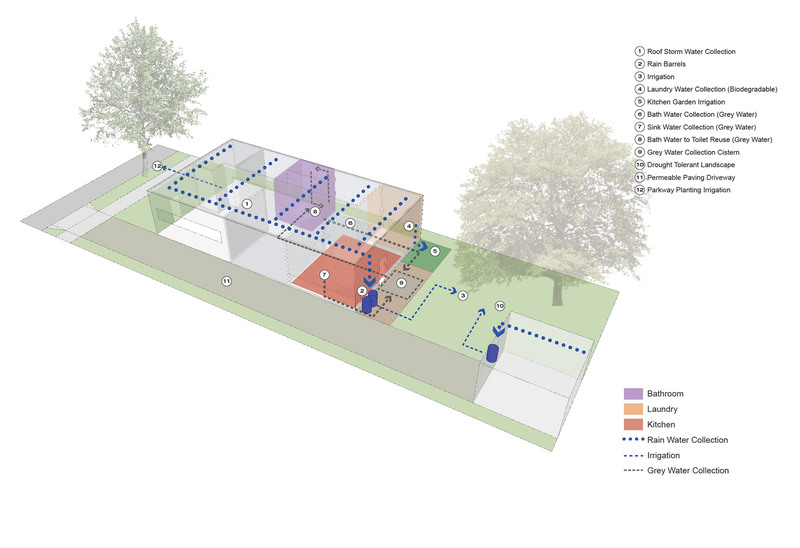 Our plans above recommend integrating exterior features like permeable paving, rain barrels, and irrigation to maximize water use when availability is limited while also aiding in replenishing local aquifers. Inside, our proposed home is equipped with a grey water system, partnered with biodegradable laundry detergents and soaps which won’t harm soil, alongside buckets strategically placed to capture water at drains and sinks to be reused for gardening or landscaping purposes. Though these propositions may seem difficult to implement, they do have recent precedent. Other countries like Australia and Israel have already integrated these solutions on a city, state, and country wide basis. There is research being done about the Los Angeles River and urban drainage which may help us use the water normally washed away into the ocean. No matter how small or large, bringing these different ideas to the table can help alleviate many of the water related issues we’re facing as a city and as a state.